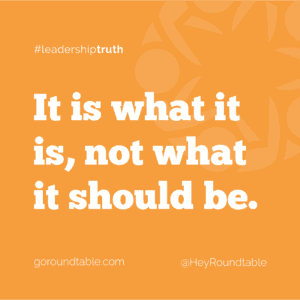 #leadershiptruth - It is what it is, not what it should be. We can waste a lot of our energy wanting things to be different. That’s especially true about people. How many times do you find yourself wishing that someone you work with would respond differently? Wouldn’t it be great if everyone was a carbon copy of our perfect, infallible selves? Of course not. Because we’re not perfect or infallible. Instead of wasting all kinds of energy wishing and willing for someone else to change, step back and reflect on what you can do to change your response to the situation you’re finding yourself in with them. What is it about their approach (or lack of approach) that hits your hot button? Where did that hot button come from within you? The more you understand yourself, the more you’ll be able to accept others for who they are and find better ways to meet them halfway.